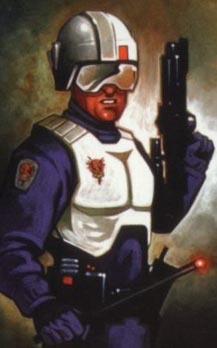 I read in one of GalacticHunter's Q and As that the Saga Legends Imperial Officer (the PotJ one) had blue eyes, making it different than it's previous PotJ release. So I bought one. Then after I compred the two, I found that the figure always had blue eyes. After I reminded myself to check before I buy, I began to look for something to do with the figure. Figures in different color jumpsuits are kinda boring, plus I had the Imperial hat to deal with - so I sliced it off and added the helmet, plus a modified Imperial Gunner chest armor piece and got my Guard.